Question: Can I do a search by client name or case number? 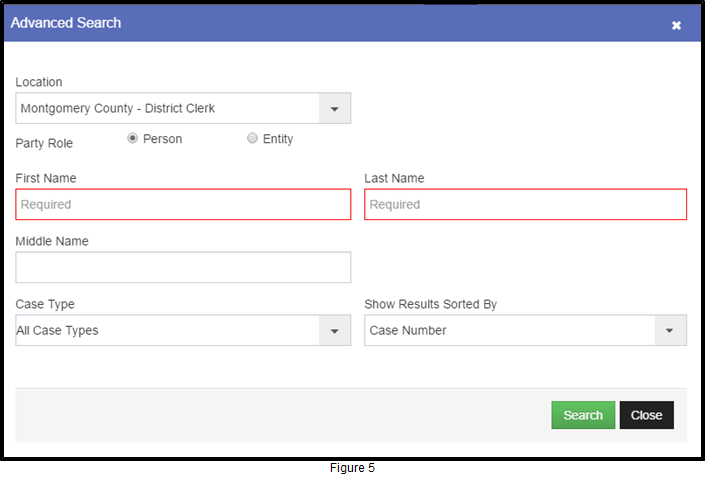 Answer: Yes, you can search for a case by case and/or by case party. You will probably find that searching by case is the fastest and most convenient way to search. After logging into www.filetime.com, bes sure you are on Workspace (Figure 1, A). Click Cases on the sub-navigation bar (Figure 1, B). The List of Cases page opens. Select the jurisdiction for the case. In this instance we are searching for Montgomery District. Type in Montgomery (Figure 1, C) and the options display. Click the highlighted Montgomery County - District Clerk (Figure 1, D). Montgomery County - District Clerk populates the jurisdiction area (Figure 2, A). Enter the Cause Number (Figure 2, B). Click the Go button (Figure 2, C).. 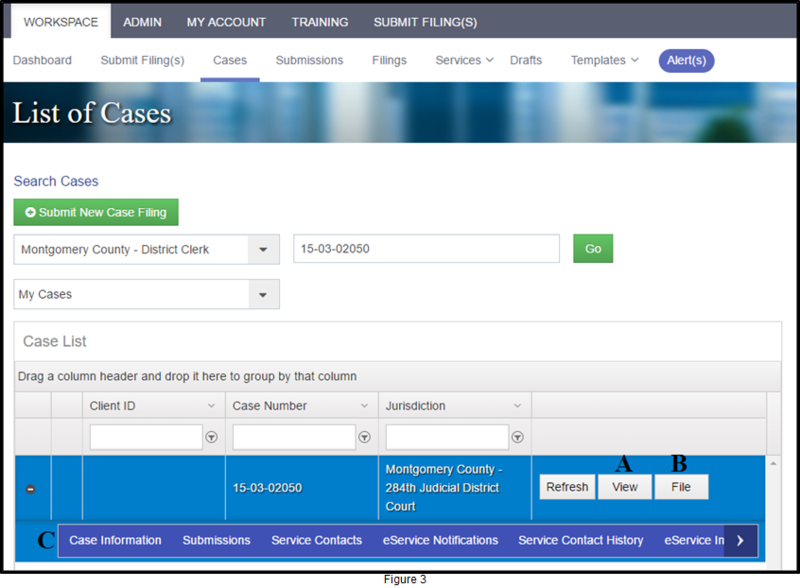 If the jurisdiction shares case data with eFileTexas, which then provides that case data to FileTime, or if someone else has previously eFiled in that case through FileTime, FileTime will present the case to you. Click the View button (Figure 3, A) to view the details of that case. Click the File button (Figure 3, B) to begin a submission for the case. 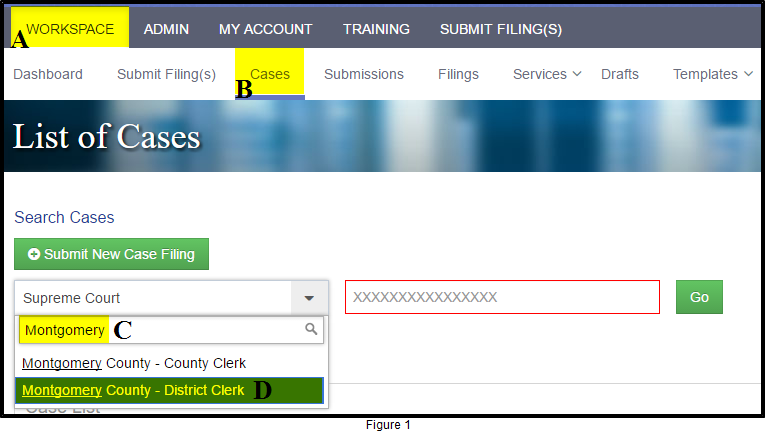 Click the + icon in the far left column to open the case tabs (Figure 3, C). Clicking each tab will provide you information about that area of the case. You will undoubtedly find it much easier to search by case but you can use the following procedure to search by case party. If the case party for which you are searching is common you will have a lot of cases to work through to find the correct one. After logging into www.filetime.com, click Cases on the sub-navigation bar. The List of Cases page opens (Figure 4). Click the Advanced Search button (Figure 4, A) in the upper right of the page. Fill in the appropriate fields and click the Search button.